Crowley orders multiple main and auxiliary dual-fuel engines for efficient, emissions-friendly U.S. – Puerto Rico-trade ConRo ships. Florida-based Crowley Maritime Corporation, the marine solutions, transportation and logistics company, has placed an order for 2 × ConRo ships. 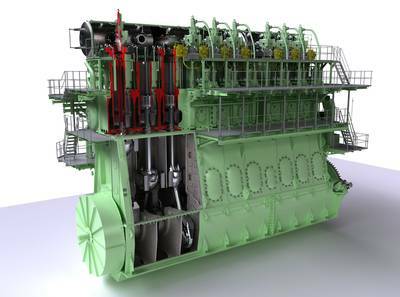 Each vessel will be powered by an MAN B&W 8S70ME-GI8.2 main engine and 3 × MAN 9L28/32DF auxiliary engines. The ConRo ships – with container Lift-On/Lift-Off (LO/LO) and Roll-On/Roll-Off (RO/RO) – will be built by VT Halter Marine Inc. of Pascagoula, Mississippi. They will be named ‘El Coquí’ and ‘Taíno’, and are scheduled for delivery in the second and fourth quarters of 2017, respectively. Crowley states that the vessels will offer customers fast ocean-transit times and, being powered by LNG, will set a new standard for environmentally responsible shipping. Tom Crowley, company chairman and CEO, said: “Our investment in these new ships – the first of their kind in the world – is significant” He continued: “[W]e are developing and using best-available technology that allows for improved emissions and alternative fuel selection”. The new, double-hulled ConRo ships will be 219.5 m long, 32.3 m wide (beam), have a deep draught of 10 m, and an approximate deadweight capacity of 26,500 metric tonnes. Cargo capacity will be approximately 2,400 teu, with additional space for nearly 400 vehicles. Crowley reports that the newbuildings will reduce the amount of CO2 emissions attributable to each container by approximately 38%. Additionally, the ships will meet or exceed all regulatory requirements and have the CLEAN notation, which requires limitation of operational emissions and discharges, as well as the Green Passport, both issued by classification society Det Norske Veritas (DNV). The ME-GI engine represents the culmination of many years’ work. The MEGI engine gives shipowners and operators the option of utilizing fuel or gas depending on relative price and availability, as well as environmental considerations. A ME-LGI counterpart that uses LPG, methanol and other liquid gasses is also available, and has already been ordered. After 20,000 hours of operation in a peak-shaving stationary application with a Mitsui-built 40 MW 12K80MC-GI engine in Japan from 1994 to 2004, Hyundai became the first MAN Diesel & Turbo two-stroke licensee to demonstrate the latest ME-GI concept in Korea in late-2012, with Mitsui following in April 2013.At the time, MAN Diesel & Turbo predicted a broad, potential market for its ME-GI engine. Subsequently, the company reported much interest in the engine and has since confirmed several orders from significant market players. MAN Diesel & Turbo sees significant opportunities arising for gas-fuelled tonnage as fuel prices rise and modern exhaust-emission limits tighten. Indeed, research indicates that the ME-GI engine delivers significant reductions in CO2, NOx and SOx emissions. Furthermore, the ME-GI engine has negligible methane slip and is therefore the most environmentally friendly technology available. As such, the ME-GI engine represents a highly efficient, flexible, propulsion-plant solution.